The little known although spectacular county of Maestrazgo does not respect boundaries: some of its villages are in Valencia and others in Aragon. 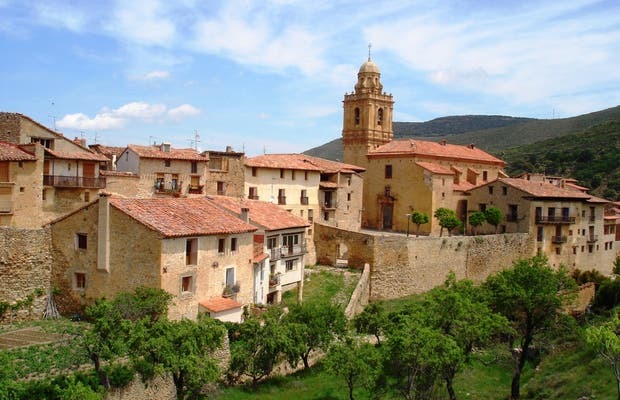 Mirambel is the most famous of the villages of the Maestrazgo of Teruel. In 1980 it was declared a historic and artistic complex and 2 years later Europa Nostra awarded it the gold medal for its restoration and improvement. Even if in its medieval streets you miss the unpainted walls and the village atmosphere of the neighbouring villages – like Tronchón, Cantavieja, and Iglesuela del Cid- it’s impossible not to admit that the village is a treasure. It is a small village of hardly more than 100 inhabitants, belonging to the Maestrazgo. It is an authentic jewel, situated 100 metres above sea level. The village is surrounded by a wall, its beauty and perfect preservation have made it to be used as a location in various films. The main entrance is by the arch of the Portal de las Monjas. Stop and have look from the other side because it’s beautiful. It’s next to the convent of the Agustinas.